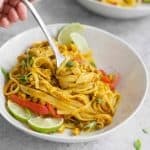 Vegan Curry Noodles! Low maintenance + simple ingredients make this an easy weeknight dinner you will keep coming back to. This complete meal is ready in less than 30 minutes! Heat 1 tablespoon oil over medium heat and add onion and tempeh, cooking until onion is soft, about 6-8 minutes. Add jalapeno, garlic, curry powder, ginger, red pepper and cook, stirring until fragrant, about 1-2 additional minutes. Add tomato paste and cook, until paste is darkened, about 3 minutes. Add flour, and cook until toasted and no flour remains visible, another 1-2 minutes. Add broth then bring to a boil. Reduce heat and simmer until sauce is reduced by ½, about 20 minutes. While sauce is cooking, cook the noodles. Bring a large pot of salted water to a boil, then add the past and cook until al dente. Drain and then add to sauce, tossing to coat. Remove the dish from heat and add in lime juice and zest. Garnish with scallions and serve.